(Nanowerk News) Nature likes some symmetries, but dislikes others. Ordered solids often display a so-called 6-fold rotation symmetry. To achieve this kind of symmetry, the atoms in a plane surround themselves with six neighbours in an arrangement similar to that found in a honeycomb. As opposed to this, ordered materials with 7-fold, 9-fold or 11-fold symmetries do not appear to arise in nature. Researchers from the Max Planck Institute for Metals Research, the University of Stuttgart and the TU Berlin discovered the reason for this when they tried to impose a 7-fold symmetry on a layer of charged colloid particles using strong laser fields: the emergence of ordered structures requires the presence of nuclei to which the atoms with the corresponding symmetry can attach. Such nuclei can be found in large numbers in the symmetries for which nature shows a preference. However, they only arise sporadically in patterns with 7-fold symmetry. The process involved here sounds unwieldy, but is, in fact, quite simple: a material has a 6-fold rotation symmetry if the arrangement of its atoms remains unchanged when it is rotated by 60 degrees - one sixth of a circle. The atoms in metals often order themselves in this way. However, more complicated structures with 5-fold, 8-fold or 10-fold rotation symmetry also exist. 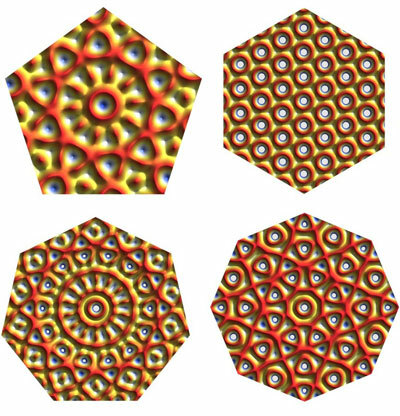 "It is surprising that materials with 7-fold, 9-fold or 11-fold symmetry have not yet been observed in nature," says Clemens Bechinger, fellow at the Max Planck Institute for Metals Research and Professor at the University of Stuttgart: "This is all the more astonishing in view of the fact that patterns with any rotation symmetry can be drawn without difficulty on paper." The question is, therefore, whether such materials have simply been overlooked up to now or whether nature has an aversion to certain symmetries. This is the question that Clemens Bechinger has been investigating with his colleagues. "The answer is of interest to us both in principle and because it could help in the tailoring of materials for technical applications," explains the physicist. The characteristics of a material are generally very dependent on its rotation symmetry. Graphite and diamond, for example, both consist of carbon atoms and differ solely in their crystal symmetry. To produce materials with 7-fold symmetry, which do not actually exist in nature, the researchers resorted to a special trick: they superimposed seven laser beams and thereby generated a light pattern with 7-fold symmetry. They then introduced a layer of colloid particles approximately three micrometers in size into the laser field. The effect of the electromagnetic field of the light pattern on the particles is akin to the formation of a mountain landscape, in which they tend to gravitate to the valleys. The colloid particles, which repel each other because of their electric charges, attempt, in turn, to form a 6-fold symmetrical arrangement. The researchers raise the profile of the light landscape by gradually increasing the intensity of the lasers. In this way, they exert increasing pressure on the colloid particles to form a 7-fold symmetry instead of a 6-fold one. "This enables us to ascertain the laser intensity up to which the particles of the 7-fold symmetry oppose each other and retain their 6-fold symmetry," says Jules Mikhael, a doctoral student working on the project. In the same way, the physicists crammed the particles into a 5-fold light lattice and observed a clear difference: the particles clearly avoid a 7-fold symmetry and assume the 5-fold symmetry at relatively low laser intensities. Therefore, nature?s rejection of 7-fold symmetries is also demonstrated in the model created by the researchers in Stuttgart. "What is crucial, however, is that our experiment also uncovers the reason why the particles stubbornly refuse to form a 7-fold arrangement," notes Clemens Bechinger. When the physicists increase the laser intensity, the particles initially only assume a 7-fold symmetry in very isolated places. Only when the intensity is further increased does the order spread to the entire sample. The researchers identified certain structures in the light pattern as the starting point for the 7-fold symmetry. These consist of a central point of light, which is surrounded by a ring of other points of light and is, therefore, strongly reminiscent of a flower blossom. "In the light pattern with 5-fold symmetry we find around 100 times more of these flower-shaped centres than in that with the 7-fold pattern," explains Michael Schmiedeberg. The density of these nuclei clearly plays the crucial role. The higher the density, the less force the researchers must exert to generate structures of the corresponding rotation symmetry. In this case, low light intensity is sufficient for the relevant order to spread from the centre. The differences in the densities of the flower-shaped nuclei alone also explains why 8-fold and 10-fold symmetries arise in nature but 9-fold and 11-fold ones do not. "The result is astonishing because it involves a simple geometric argument," says Bechinger: "It is completely dependent on the special nature of the interaction between the particles, and applies, therefore, both to our colloidal systems and to atomic systems." The experiments explain, first, why it is no coincidence that materials with certain symmetries are not found in nature. Second, they demonstrate a concrete way, in which such structures can be made artificially in colloidal systems - that is with the help of outer fields. This could be useful for the production of photonic crystals with unusual symmetry in which, for example, individual layers of colloids with 7-fold rotation symmetry are stacked on top of each other. Photonic crystals consist of microstructures, which affect light waves in a similar way to that in which crystal lattices affect electrons. Due to the higher rotation symmetry, the optical characteristics of 7-fold photonic crystals would be less dependent on the angle of incidence of a beam of light than the existing photonic crystals with 6-fold symmetry. In addition to this, materials with unconventional symmetries have other interesting characteristics, for example very low frictional resistance. As a result they can improve the sliding capacity of mobile particles in the form of thin layers. "Overall the search for materials with unusual rotation symmetry is of considerable interest," says Clemens Bechinger: "Our results can help to identify the particular symmetries that are worth looking for."